Accessing mission critical information, including eLearning and other online learning resources, with an employee's own device whenever and wherever they may be reduces a barrier that limits adoption and engagement. Well over half of all companies promote one of these four types of bring-your-own-device policies. There are good reasons for this. First, if employees are supplying their own devices, they are responsible for any associated costs. Depending upon the size of a company, this can lift a hefty financial burden. Second, most individuals are experts at operating their personal mobile devices and need no assistance in this area, which frees up valuable training time. A BYOD policy also makes it easy for employees to access corporate data and online training materials, which can increase productivity. Of all the benefits listed here, increased productivity usually pleases company leaders most. Some organizations choose to implement BYOD solely for the purpose of augmenting productivity. Clearly, BYOD has the capacity to lighten the workload of employees and free-up time that could be spent on other tasks. However, it’s probable that companies seeing this level of benefit from a bring-your-own-device policy have, as Dell’s Roger Bjork said, approached it with a thorough plan. “81% of employed adults use at least one personally owned electronic device for business. 59% of employees surveyed use mobile devices to run line-of-business applications (Ibid). 74% of companies allow BYOD usage in some manner. 50% of companies have experienced a data breach due to inadequate device security. 71% of companies state that they support and/or tolerate BYOD. Only 29% have forbidden BYOD. The number of connected devices per employee (was) 3.3 in 2014. 43% of companies have unveiled a BYOD security strategy. 50% of companies that apply BYOD have the employees bear all costs for this. The number of tablets that companies offer their employees will increase by 50% a year. 73% of those who use tablets at the workplace surf the web. 69% of those who use tablets do so to read and write e-mail. Numbers don’t lie. The fact that 7 out of 10 companies enable BYOD proves that companies are benefiting from this trend and that it is likely here to stay. The question is why do thirty percent of companies forbid BYOD? Compared to its benefits, the downsides of a bring-your-own-device policy are few but significant. 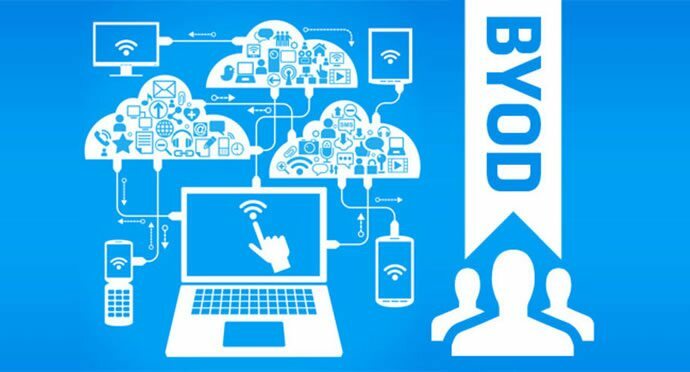 Since these issues may be preventing 30-or-so percent of companies from jumping on the BYOD bandwagon, they are worth taking a look at. First and foremost, a bring-your-own-device policy can increase the chances of breaches in security. This threat is most to blame for any company’s hesitation to embrace such a policy. BYOD employees have increased access to enterprise data. This is the main security risk associated with BYOD. It can be tough for some IT departments to control this level of access, which can leave a company in a vulnerable position. Also, there is the issue of a personal device with access to sensitive data becoming lost. The bottom line is that company leaders want to remain in control of important data, which is why some shy away from BYOD. Another study reported by CRN shed some light on the number of people who are genuinely concerned about BYOD being a security hazard. In his article BYOD and Security: The Biggest Threat of All, Robert Westervelt explained that a “survey of 3,300 IT professionals was conducted by B2B International and Kaspersky Lab in 2012. Survey respondents were from 22 countries and all indicated they influenced IT security policy. The survey found that 34 percent of respondents considered mobile devices a serious threat to business, and 55 percent said they were thinking more about the security of corporate smartphones and tablets than they did last year.”5 The study concluded that most individuals who worry about the security ramifications of a bring-your-own-device policy still choose to implement one. Security issues aside, many company leaders avoid implementing BYOD for fear of employees blurring the lines between work life and personal life. This is a valid concern. After all, those who work on personal mobile devices can check professional emails one minute and shoot text messages to friends and family the next. This is another key reason why some organizations are against BYOD. It’s understandable that leaders want to retain control over company data and limit employees’ personal communications at work. However, forbidding BYOD may not be as effective as these leaders hope it will be. A no-BYOD policy won’t stop employees from bringing devices to work and using them for professional and personal purposes. What it will do is erase the devices’ visibility, which only hurts a company in the long run. Dave Martin, vice president and CSO at Hopkinton, said, “Ask anyone who says they don't have BYODs to review their logs—I guarantee they'll find Mobile Safari. Disallowing BYODs just pushes them underground where you lose visibility. I'd rather see BYODs and deal forensically with risks than try to convince myself that I can block them outright. Experience has shown that's a failed strategy; users find a way in. But if you're too permissive, you're open to data loss. We are unable to lock down BYODs in the same way, so we need to be smarter about how we use them. "6 Again, a plan is the secret to ensuring a successful and safe BYOD policy, which workforces demand in one way or another. Creating an agreement checklist is essential and can lessen any initial confusion or trepidation surrounding a new policy. Another step in a BYOD implementation plan directly addresses the security concerns so many people share, and it is launching a learning management system (LMS) with available mobile learning access. Can an LMS Remedy BYOD Security Issues? A learning management system is capable of a great many things, but its main reason for existence is to facilitate training. These systems are designed to give people access to training materials and company data. Full-featured eLearning platforms also come equipped with social learning features that allow users to access their social media accounts and engage in realtime chat, web conferencing, etc. LMS administrators can store whatever information they wish on a social learning platform. This means they can omit sensitive materials if they so desire. They can also limit what data a user may access on a personal device (or any device, for that matter). Quite simply, an LMS gives administrators what it is they really want and need to make BYOD work: control over enterprise data. Mobile learning, or mLearning, is another important aspect of a learning management system. Mobile learning and BYOD are enhanced by one another. mLearning, which is simply learning that takes place via a mobile device, can happen apart from a bring-your-own-device policy. Long before BYOD was a trend, mobile learning was taking place on company-owned devices. However, mobile learning is more effective with BYOD. With mLearning, which is enabled by an LMS or another social learning platform, employees can securely access whatever data has been stored on the cloud, 24 hours a day, 7 days a week, any place, from any device with a Web browser and a connection to the Internet. mLearning is convenient no matter whose device is being used. Still, it is most convenient on a personal device and is best enhanced by a bring-your-own-device policy. As is the case with any policy, there are pros and cons to BYOD, but many companies find that its assets far outweigh its liabilities. Company leaders deliberating about implementing a bring-your-own-device policy may want to take the plunge and see what happens. Worst-case scenario is that there is a breach in security or employees allow their personal lives to encroach too closely on the workplace. In these cases, the policy would simply be cancelled. Best-case scenario is that employee productivity is increased, creativity and innovation are heightened, collaboration is fostered, and worker satisfaction is enhanced. There’s only one way to find out what scenario will result, and that is to give BYOD a chance.